I bought an Arc’Teryx hardshell jacket last year after hours of research and months of consideration. I’ll get into the specifics of why I made that choice (and my thoughts on Arc’Teryx in general) in other articles/reviews, but for now I’m going to talk about an issue I ran into while trying to figure out what I wanted: shopping for Arc’Teryx apparel is confusing. First, there are the names: Alpha, Beta, Theta, Gamma, Delta, etc. These aren’t individual jackets; they’re entire categories of jackets. They’re further defined by a two-letter suffix: SV, AR, LT, SL, FL, MX… the list goes on. Great… so the only differences are the pockets (hand vs. chest) and the length? Not so fast… when you go back and look at the pictures, the pockets appear to be identical¹. They’re off-center like hand pockets but chest-high like chest pockets. When you look at the Alpha series, the description says chest pockets as well but they’re centered (the pocket zippers are just to either side of the jacket zipper). And the letters: SV (Severe), AR (All Around), LT (Lightweight), FL (Fast and Light), SL (Superlight)… First of all, what’s the difference between Fast and Light and Superlight? And how does SL on an Alpha jacket compare to SL on a Beta jacket? DropHood – Has a separate collar around the jacket; hood pulls up over collar. I think this variable has the most impact on the price of their jackets. At the time of writing, the Alpha FL is the least expensive GoreTex Pro jacket in Arc’Teryx’s lineup at $400. Most Pro jackets start at $500. Also look out for the terms “Paclite” and “3L Tricot”. These are referring to the type of backer, or liner, not the membrane itself. The backer is the material you see on the inside of the jacket. Paclite is considered a 2.5 layer vs. a 3 layer jacket, which I’ll discuss more in a separate article. Note that, currently, you’ll only see these terms when they’re referring to the Standard or Active membranes. GoreTex Pro uses a different backer called Micro Grid, which is a 3 layer construction. I believe one of the differences between the 3L Tricot vs. Micro Grid is that the former is a knit fabric while the latter is woven, but I’m not 100% sure on that. Also, there seems to be a big difference between the old “Pro Shell” membrane vs. the newer version, which is just called “Pro”. Arc’Teryx jackets released since the fall of 2013 have the latter. ProLite Gear has a good video showing the difference here. The face fabric is the material on the outside of the jacket, and it requires a little bit of explanation in order to demystify what these numbers mean. The following formula can be applied: (Material) (weight/denier) (weave). So a jacket that has a combination of N40r and N40p means that it’s all nylon (N), it’s all 40 denier fabric (40), and the weave is a combination of ripstop (r) and plain (p). Some jackets (like the Beta AR) have a combination of N40 and N80, where the 80-denier fabric is added to high-wear areas like the shoulders and arms. Trim/Athletic/Expedition – This mostly has to do with the amount of room to layer beneath it. For the most part this is the Theta line vs. the rest, since that series is the only one that’s cut significantly longer than the others. There is a difference in length between the Alpha and Beta, but it’s small, probably about an inch. I think the Alpha series has a slightly more dramatic taper from front to back as well. So, is that it? When we’re talking about the standard hardshells in the the Alpha, Beta, Theta, and Zeta series, and not winter-specific shells like insulated and ski-featured jackets, yes. There are some minor differences between them, like whether the hood adjustments are on the inside or outside of the jacket, and the Alpha series has a small foam insert in the hem to keep the jacket from sliding up under a harness, but for the most part, that’s it. Happy shopping. ¹ I’m sure this is just a typo on Arc’Teryx’s site and that the Theta series should be considered to have “hand pockets”, but given the amount of other information one needs to sift through to understand the differences between them, it certainly doesn’t help the situation. Thanks so much for the explanation of the Arc’Teryx hardshell jacket! I wasn’t able to find this much information even at the GORE-TEX website. I’m looking for a lightweight jacket for resort and backcountry skiing, and have been trying to decide between the Cassiar with N70s-4 3L GORE-TEX fabric and the Sphene with N40p-X GORE-TEX Pro 3L fabric. I like the soft feel and stretchiness of the Cassiar, but prefer a lighter-weight jacket, although I was told that that that fabric provides some insulation. (Perhaps that explains the extra weight.) The shop I’ve been to doesn’t carry the Sphene, so I don’t know how that fabric feels, although I understand that the GORE-TEX Pro fabric is most breathable and performance oriented. Do you have any knowledge or opinions on either these two fabrics or jackets. Thanks! Hi Preston, i have almost the same question but hesitate between the Sabre (made with N80p-x: is a super-durable, waterproof breathable hard shell fabric created by Arc’teryx in conjunction with W.L. Gore.) and the Cassiar (made of n70s, i believe ”s” is for strecth, the number 70 is for denier). The Sphene is now called the Rush i think. So which one did you pick ? I tried the Sabre and i returned it under warranty. It s time for me to pick a new one and i am not too sure: i though the more expensive Cassiar would have a better fabric, but not sure since it is a n70 and the sabre n80… I liked teh Sabre but was not in love with it (easy to get dirty). Thansk for your opinion. 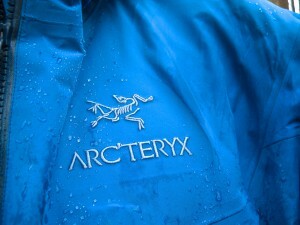 I have been looking for a long time at Arcteryx jackets as well. Thank you so much for the breakdown. Which jacket did you end up purchasing? Hi Brittany, thanks for reading! I wrote this back in 2015 shortly after I purchased an Alpha LT, which sadly they no longer make. I thought it was the perfect combination of features that I was looking for: Goretex Pro membrane, storm hood, 2 chest pockets, pit zips, 40 denier fabric (vs the heavier 80), etc. The Alpha SL isn’t Goretex Pro, the Alpha AR has the heavier fabric in some areas (which I didn’t need), and the Alpha FL doesn’t have pit zips. If I had to buy a replacement today I’m honestly not sure which jacket I would get, since none of them meet all of those specs anymore. But they are all still amazing jackets, it’s hard to really go “wrong” with any of them. I second the above! Thank you for helping sorting out all the options and making the decisions (somewhat) easier, or at least more understandable! No problem! I’m happy somebody got some use out of it. I haven’t updated this site in quite a while because I’ve been focusing more on photography for the last 2 years but I hope to get back to it this year! Thanks to this help and guidance, have it narrowed down to the Sentinel, Astryl or Beta AR for downhill skiing. Need to check them out in person somewhere now. Thanks again! Sure thing! It’s been a couple of years since I wrote this so I had to go back and see what’s out there now. As far as skiing, obviously the first 2 are tailored for that purpose since they’ve got snow skirts, which you may or may not care about. If you’re mostly going to use it for skiing, I would probably lean towards the Sentinel since it probably has a little more room for layering underneath. The Astral says “Trim fit”, which, depending on your layers, could cause your undergarments to bunch up and be a little uncomfortable. I haven’t seen either of those jackets personally, though, so I can’t speak to this with any certainty. If you’re going to use the jacket for anything else (hiking/backpacking/general use), the Beta AR is the better choice. It’s lighter, the Goretex Pro is more breathable, and the drop hood is more comfortable when you’re wearing the jacket with the hood down. There’s a reason it’s been one of their staple jackets for so long. Overall, though, it’s hard to go wrong with any of their jackets.